I have lotion on my bedside table. I have lotion on my kitchen windowsill. I have lotion in my bathroom, in my purse, and in my car. If I don’t put lotion on my hands at least once an hour I feel like they are going to dry up and blow away in the wind like “He Who Must Not Be Named” at the end of Harry Potter. If you didn’t know that happens then I don’t care that I just blew it for you. You have had ample time. (Nerd Alert, I know). As you all know I have a love affair with coconut oil and use it for EVERYTHING. If you haven’t read about my obsession you can do so here. I do use it on my hands, but sometimes I need something that absorbs quickly if I’m going to be touching stuff I don’t want to get oil on. As great as coconut oil is for moisturizing, it can linger on your skin. I wanted to keep using my beloved coconut oil but was thinking of how I could make it absorb quickly when I was using my hands a lot but still needing my lotion fix. I tried mixing a bunch of natural stuff together to find the perfect lotion. Did I find something amazing? You know it. I tried and failed plenty of times. Some things were too thin, some too thick. Some smelled awful. There were a few ingredients I knew I HAD to use since they are known to do amazing things for skin. 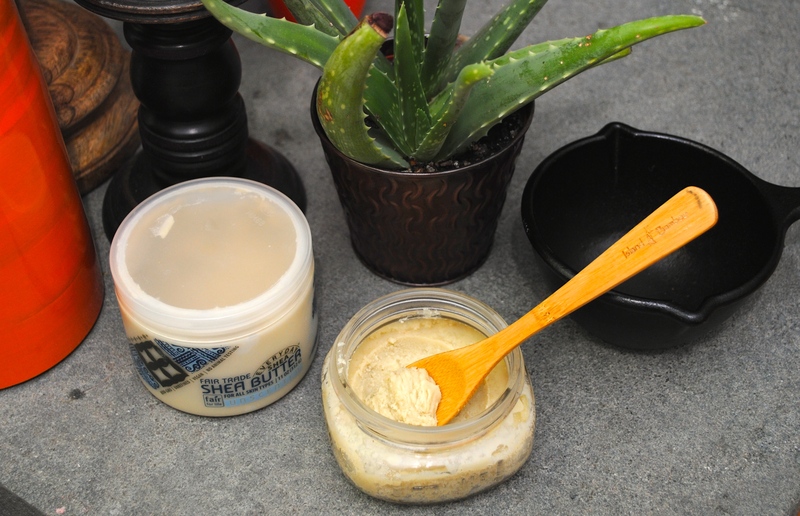 These ingredients are none other than coconut oil (duh), shea butter and aloe. The shea butter is what gives this lotion its great texture. It is full of vitamins A, D and E and has essential fatty acids and phytosterols (thought to bolster collagen production and slow down the aging process). 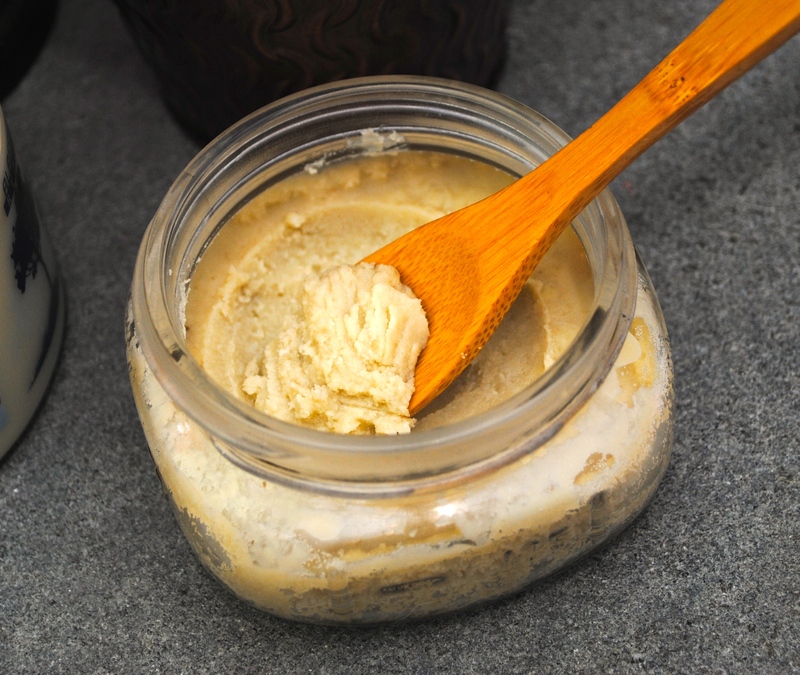 Shea butter on its own is very thick and not very spreadable. Add the coconut oil and the aloe and you are left with a smooth, great smelling lotion that spreads easily, moisturizes like a dream and smells lovely. The trick to making this lotion is to warm the ingredients on your stove so they mix evenly. I have a small cast iron pot that has a spout for easy pouring, but any small sauce pot will work. Put the shea butter in the pot first on lowest heat setting. It may take a while to melt. You have to be patient here. If the heat is too high you will burn the shea butter and it will turn an ugly brown color and smell icky. If ten minutes goes by and it’s not starting to melt, turn up the heat SLIGHTLY and wait. Break up the shea butter with a spoon and keep it moving in the pot for quicker results. Once it is melted, add coconut oil and aloe. Feel free to add any essential oil you like. Grapefruit and Jasmine are a few of my favorites. You can read up on essential oils here. Lastly, mix in cornstarch. The cornstarch helps bind the ingredients and cuts down the oily texture. Mix it well and pour into shallow glass mason jar. As the lotion is cooling, stir it every 15-20 minutes or so to avoid separation. You can put the jar in the fridge for quicker setting. Once it is solid it’s ready to be used and will not need any more stirring. The color is a bit brown. People are sometimes put off by this. Consider this, many natural things are brown. All that store bought crap lotion is only stark white and flawlessly creamy because it is composed of chemicals that make it look that way. Who cares what it looks like? Once you rub it into your skin it all looks the same. Enjoy your amazingly moisturized skin green people! You can purchase a single aloe leaf at most health food stores. Whole Foods has them as well. Check this out if you aren’t sure which type of coconut oil to buy. If you feel the lotion is still too oily, you can add more cornstarch. You should be able to mix it in with a little elbow grease. If not, melt again and add in one teaspoon at a time until desired texture.